We went back to Church #2 the Sunday night before last and learned that they would be having a Seder on Palm Sunday. I would like to say here that it is truly amazing how the Lord provides as my husband and I have been wanting to do a Seder, but just had not for various reasons. We both were eager for our daughter to participate in this tradition with many other believers and signed up to bring a roast and unleavened bread, so yesterday we arrived at 4:45pm and were given some duties to help prepare the meal. My husband prepared the water in bowls for cleansing our fingers and the salt water in which the bitter herbs are dipped. I poured drinking water along with a woman pour the grape juice (instead of wine) from which we would drink four times during the meal in observances of specific things. 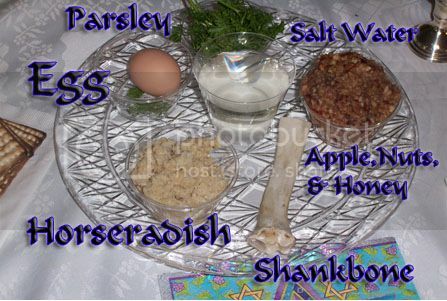 One man prepared the Seder plates with parsley, prepared horseradish, and a sweet apple mixture. In the beginning we took the matzah (unleaven bread) and broke it so we would have three pieces. At one time we were to take some of the horseradish on the matzah to eat. Many had a reaction to that, but it did not bother me as much as I like wasabi with my sushi, which is basically the same thing. My husband told me that it is traditional that they take enough horseradish to cause the eyes to tear, but few did that and even those seemed unintentional. I actually liked the sweet apple mixture with the horseradish which we had on the second piece of the matzah. This Seder was done with a Messianic style as we believe the Messiah has come so the last piece of matzah was after the main meal as the communion service. The Princess being under 13 years old was asked to read a portion that were four questions that a child should ask and that are answered during this precious observance of the Passover. The pastor asked all the children under 13 to cover their eyes while he hid the afikomen, matzah placed in a cover or bag for which they will search after the main meal. There were two boys and the Princess, they did not have a chance. She found it and was given a dollar. Afterward there was just praise and worship. I should not say "just" as it was very moving. The Princess immediately grabbed a pair of flags and later she when for a large one with "holy" written on it. She is quite the flag waver. There were three that came forth with prophetic words and visions. My Princess approached the pastor and told him that she has had an ear out of which she has not been able to hear for a few days possibly from water being trapped and she has learned that asking for people to pray over her is not being selfish, and that at our old church three people had not asked to be prayed over for healing when they knew they had to have surgery. The pastor prayer over her closed ear and also the closed ears in the churches. She is not at all shy and I am so glad that she has had the opportunity experience this freer form of worship. People love that child and she does not even realize how much she is used by God! Later we were asked to pray over a woman who had just come out of ICU just a couple of days before. When everyone else began cleaning up, I went back to her and prayed over her some more. I knew all kinds of things about her, like she had trouble sleeping, but I also knew she would sleep better that night. A little later she was able to breathe without any pain and just before she left I saw her walking without her cane and oxygen. She told me that she has died a couple of times but came back from heaven because she did not feel that she was done here. I would like to hear more from her. Another woman there had been burned by steam a week before at her job, but it still looked terribly red so I prayed over her for that and the sciatic nerve problem I felt from her as well. there was a place on her leg that was completely numb, but it began tingling as I prayed. She thanked me for being obedient to God. I cannot fully tell you how wonderful it is to be with people who are believing believers. After my husband finished up in the kitchen (that man loves cooking and kitchens), he talked with two men who hunt and one raised rabbits for the family as we do. They have New Zealand blacks and we have whites, but it is good to know someone with whom you can trade for a non-related breeder. Church #2 will not be having services next Sunday night, which is Resurrection Day. Most of the people who gather there, as they do not have members, are members of churches. Some will be going to sunrise services so that would make for a long day for them, particularly if they have a family get-together also, but they are going to be starting a series on healing of abuses. I am interested. Last night my husband wanted to find a book I reviewed nearly a year ago on healing, The Essential Guide to Healing: Equipping All Christians to Pray for the Sick, so that he can take it with him while he is away for work this week. It seems that the Lord is leading us all to understanding how to be obedient in praying for healing. I think I know a bit how Jesus felt when He said that He had not seen such faith in all of Israel as I have rarely seen it in any church. We arrived home very late and the Princess did not get an early start today, but I think what she learned and experienced last night was far better than textbooks, so we had shorter lessons than usual. Her ear is fine today also. Yes, we are travelling a strange road just now where we have a great church to attend, a forming church & one in dissaray where we are still being called to minister. *sigh* I feel a tad overwhelmed some days. Looking forward to being finished with school at the end of next term. I think that the Seder is a tradition I would like to continue doing and it was very nice to have it with others. I am glad the Princess was able to actively participate in one before she turned 13 years old. God is good, all the time.